Pho aka heaven in a bowl, is specifically, noodles that are served in a broth cooked from meat and spices. And, it’s just one of the many highlights of a trip to Vietnam. 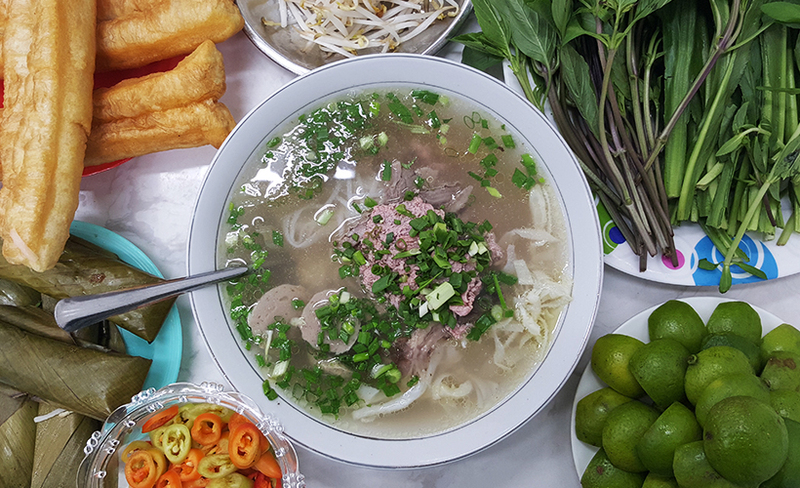 In Ho Chi Minh City located in the south of Vietnam, pho is just a little different than it is in the north. 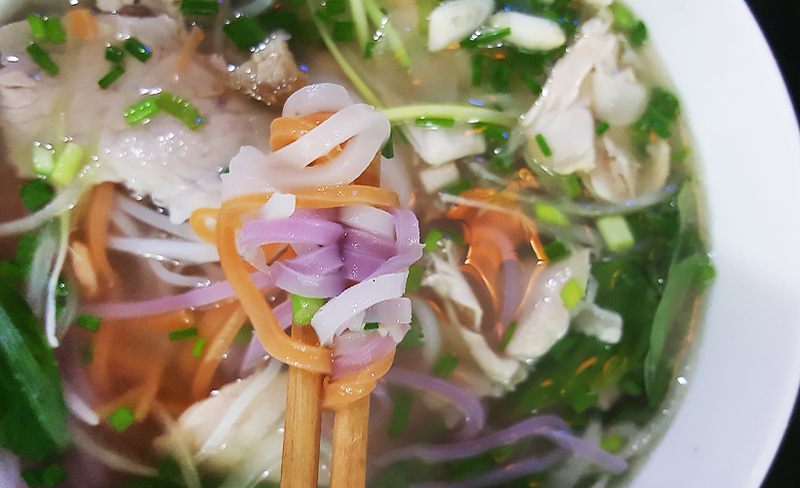 This style of southern pho has more varieties of noodles, meat, and broth, not to mention a lot more garnishes such as lime, basil, cilantro, bean sprouts, and sauces. After eating our way through the city’s numerous restaurants and stalls – for pho and other noodles – we’ve shortlisted the following six as our favourites. 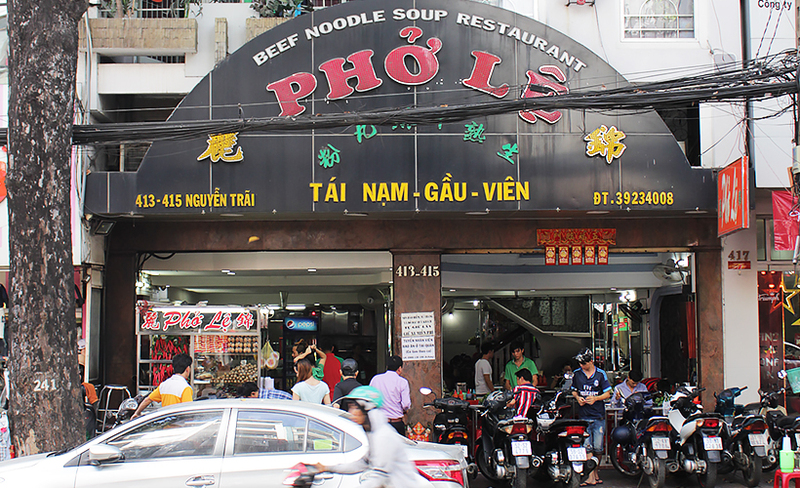 This is one of the city’s most famous pho places, serving huge portions and consistent quality throughout the years. The broth is a clear, sweetish soup with a good level of beefy aroma. Everything tasted really fresh, and you can tell that there is no MSG. It definitely lived up to the reviews. Nearby attraction: Turtle Lake is a busy roundabout where the young working class like to gather after 5 pm for street food. We visited this on the recommendation of a Vietnamese friend, who did warn us that the food may not be consistent. It must have been our lucky day as we really enjoyed the Bun Ho Hue, a thick beef broth noodle that is savoury and similar to a beef stew. Nearby attractions: HCMC’s iconic landmarks such as Ho Chi Minh Square, Ho Chi Minh City Hall, and BITEXCO Financial Tower (the tallest building in Vietnam) are all within walking distance. This is our absolute favourite; the soup, which leans towards the sweet side and is bursting with flavours. Although the serving size was huge, we were still hungry for more! This is the one place we would go back to again and again. Nearby attraction: An Dong Handcraft Market is the city’s biggest wholesale market, and they also cater to retail shoppers. There’s an excellent range of apparel, accessories, and more food. We weren’t expecting much as it’s a fast food joint but to our surprise, the noodles were decent. We wouldn’t go out of the way for this but if you have time to kill or are hungry before catching your flight, go for it! This street-front shop is easy to find. Their signature is the 3-coloured pho and rice noodle rolls. The colours are derived from natural vegetable dyes that don’t lend any additional flavours to the noodles, but they do make the food look vibrant and appetising! The place itself was not all that comfortable as the air-conditioner wasn’t functioning well so it felt rather humid. But the food was satisfying and it’s a convenient place to refuel after trawling the nearby evening bazaar. 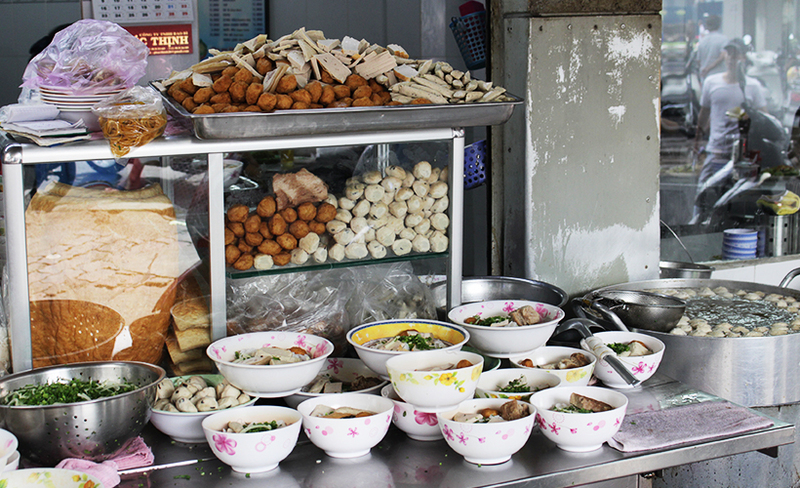 Nearby attraction: Bui Vien Street is a backpackers’ area with a lively night market. There are also tons of bars, pubs, massage and tattoo parlours that open until the wee hours of the morning. This place is popular not for pho but pork noodle soup, featuring rice vermicelli. If you want something truly authentic and local, this is it. We had my first breakfast here and was surprised at how filling it was, even though the portion wasn’t big. The vermicelli is topped with several types of pork balls, minced pork, pork ribs, and offal. It’s a delicious and hearty way to kick-start a day of exploring. Nearby attraction: One of HCMC’s best-known landmarks and its oldest surviving markets, Ben Thanh Market is worth a visit whether you want to shop for souvenirs (fabrics among the best buys here) or admire its French colonial architecture and clock tower. If you have room in your stomach for another HCMC must-eat, take a 10-minute walk from Ben Thanh Market to reach Banh Mi Hyun Hoa (26 Lê Thị Riêng, Bến Thành, Quận 1; opens 2.30pm–dinner), famous for their version of the Vietnamese baguette sandwich with different types of cold cuts and pate, topped with coriander. This is a takeaway-only outlet, so there are no places to sit (and the owner shooed us away for sitting on his little chair!). We really enjoyed the banh mi and was glad to get there 15 minutes before opening time because as soon as they opened, there was a queue. Make sure you go early! Three-month-long vacations, twice a year. Read the original article on Zafigo.